It might be Friday the 13th, but it's actually your LUCKY day. 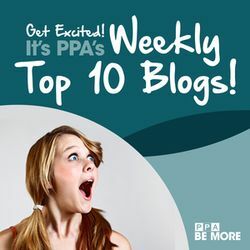 The PPA Weekly Roundup is here! Kick back and enjoy your weekend with the best photography articles from around the internet. COPYRIGHT: In case you missed it last week! The legislation we've been fighting for has finally hit the floor of Congress. Read about the Copyright Alternative in Small Claims Act (CASE) and contact your congressperson now! MARKETING: There are many different ways you can use Facebook ads, including building out a mailing list for your photography services. After reading this CurrentPhotographer article, you'll know the difference between Customer Lifetime Value and Cost Per Action and what they could do for your business. INSPIRATION: Everyone's journey to full-time freelance is different. FStoppers writer Mike Briggs takes us along on the journey of his first year, from the honeymoon period to the lessons learned. You'll find a lot of inspiration in his ten tips on how to navigate freelance. HISTORY: Eddie Adams, the famous photographer who captured the iconic shot of a Vietcong prisoner being executed in the street in 1969, has been teaching a workshop for three decades. This video from CBS Sunday Morning takes a look at whether people can be taught to create a great photograph. NETWORKING: Harvard Business Review talks to venture capitalist and entrepreneur Rich Stromback, a master networker, about his "counterintuitive" advice. Including "Don't Care About Your First Impression" and "Sleep From 4-8pm Every Day"...You really need to check these out. Guaranteed to make you rethink how you network as a photographer! This is very timely so you can make even stronger and more meaningful connections at Imaging USA! PREPARATION: Choosing the best time to transition to full-time professional can be a daunting proposition. Writer Scott Choucino presents five things you must consider before making the decision to be full time. Read these and your own answer will become clearer. IMAGING USA: Excited yet for 2018's Imaging USA trade show and convention in Nashville? This video will get you there as you take in all that the world's strongest photography show has to offer! TECHNOLOGY: DPReview has details on the new AI that can tell how 'good' your photo is, insofar as such things can be analyzed objectively. The software breaks photos down into the categories of Aesthetics, Sharpness, Exposure, Colors and Properties and scores each. What will they come up with next? ART: Is selling your work "proof" of artistic validation? Or is the selling of your work your business, and how do you receive artistic validation? The Luminous Landscape has this though-provoking article that lists several ways you can gain artistic validation without sacrificing your sales. BUSINESS: As you set out to be a professional photographer, you need to know what pitfalls to avoid and how to keep yourself sane and financially healthy. Contrastly has this article up on how to ensure you're creating lasting relationships with clients and not overlooking the little things.